When I visited Nepal, I knew I would need to pack differently than I typically might for any other trip. 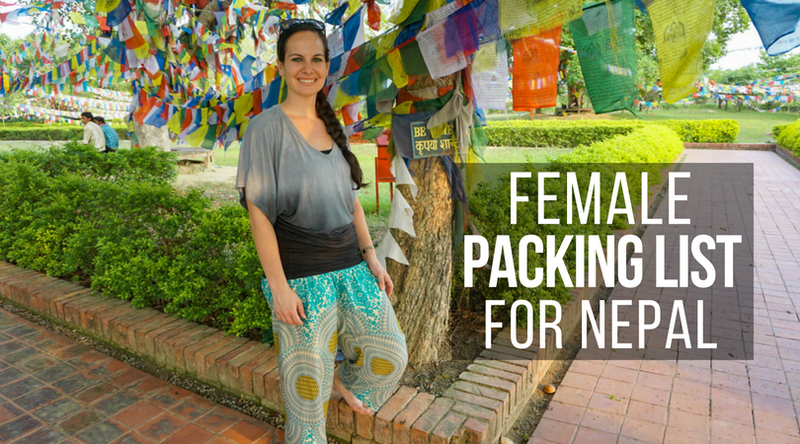 I scoured the internet for the perfect female packing list for Nepal, but I kept hitting the same road block… every single packing list I could find was for trekkers. And I had no plans to go trekking. There are so many things to do in Nepal besides trekking, so I encourage you to still visit for the other highlights of Nepal that shouldn’t be missed, like the culture, wildlife, and food. To help guide you as in preparation for your trip, I put together this 12-day female packing list for Nepal based on what I packed for my own trip in late May. My bag of choice is my trusty 48L REI carry-on backpack. You’ll be able to get around with regular luggage if you have transport arranged during your trip, but I found it much easier to navigate with just a backpack. Dramamine, or other motion sickness medicine – I like the Dramamine less drowsy formula for short flights or bumpy car rides where I want to stay awake – you’re going to thank yourself for all the long bus rides along curvy Nepalese mountain roads. For longer flights I use the original formula that doubles as a sleeping pill for me as it puts me right to sleep. Vitamin C – An immune system boost is a must after being on the road for so long. Ipanema Maya sandals – I have been traveling with these sandals for years. They are super comfortable and double as a dressier shoe if needed since they are fancier than plain flip flops. Camera and charger – I’d be lost without my Sony a6000! TSA cable lock – Deter theft and help keep your items secure with a TSA approved lock. This one has a flexible cable that allows you to maneuver the lock to fit where you need it to. GRAYL filtration water bottle – The water from the tap is not typically safe for drinking (or brushing your teeth with) in Nepal, so this water bottle is a must, and it helps save plastic. 2 in 1 flashlight lantern – There are regular power outages throughout Nepal, so it’s good to be prepared with a backup light when that happens. Don’t forget to leave some space to take home souvenirs! There are so many shops you’ll pass through on your trip and you can get some amazing deals. Believe me when I say you’ll certainly be taking some goodies back home with you! Have you been a non-trekker in Nepal? What packing recommendations would you add? Special thanks to the Himalayan Travel Mart, Pacific Asia Travel Association (PATA), and Nepal Tourism Board for facilitating this Nepal trip. All opinions are my own. Please note that some of the links on this page are affiliate links, and at no additional cost to you, I earn a small commission that will help support this site if you make a purchase. If you have any questions about the companies or products mentioned on this page, please reach out to me and I will happily answer them. Every traveller thinks once for it, you have given very useful tips. This will gonna help many travellers. Thanks for sharing this post. Great tips! It really helpful for travelers. Thank you so much for sharing a great information with us. So amazing packing list you shared to enjoy things of beautiful Nepal. its really amazing place to get fun and stunning photos you shared. Nepal is beautiful place and its not for only trekkers. There are so many good temples to visit and you shared good packing list to plan things of Nepal. Thank you for sharing all of your tips. I found this very helpful since I will not be Trekking either. My vacation is planned for January 2019 . I know the weather will be much different, much colder then. Do you have any tips or have you come across any other pages similar to yours regarding colder weather in the fall and what to pack as a woman? Hi I’m going to Nepal early December on an organised tour. I’m 63 and reasoably fit and we are not trekking as such. I know we have the option of a ‘soft’ downhill trek one day which I hope to do. We are staying in hotels and visiting a national wildlife park for a couple of nights. We then go on to india’s Golden Triangle for 5 days. I’m concerned about the right clothes to take as I think it gets quite cool in Nepal in the evenings and nights.I’m expecting India to be warmer. I have been reading as much as I can about how to behave and what to expect. Can you give me some advice on clothing in particular, Will we need a warm coat/jacket etc. Hi Wendy! I visited in May, so this packing list is for quite a bit warmer weather. December is the beginning of winter in Nepal, so it will definitely be chillier. You may need a light jacket during the day. At night it can sometimes drop down to freezing temperatures so a heavier jacket will be necessary, and you may want to bring a light pair of gloves. I’d recommend also bringing a scarf (a lighter one, not a winter one) so you can use it for fashion and warmth as needed. If you wanted, in the larger cities in Nepal like Kathmandu or Pokhara you will be able to buy a sporty jacket there (meant for trekking) at a pretty good price. Because of the altitude in Nepal it will be quite a bit warmer during the day when the sun is out, but will definitely drop down at night. Hope this helps! Enjoy your trip, it sounds like a fun route!